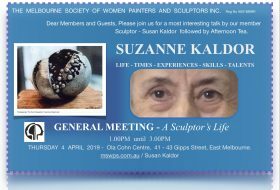 Suzanne Kaldor will present a talk for your pleasure on Thursday 4 April from 1.00PM. The Life Drawing session begins at 10.30 $10 members & $15 non members if you plan to make a full day with us. Suzanne has been a member of MSWPS since 2003 – she has been a very active member and has helped to organise our general meetings in past years. Her friendship with the Melbourne, German borne Sculptor Inge King 1915 – 2016 was a pivotal influence for Suzanne’s career.